An angry new Mitsubishi Outlander GT Prototype just bowed here at the New York Auto Show, wearing the "jet-fighter" Lancer nose up front and a revised V6 behind it. The Outlander GT Prototype is a preview of the production version slated to replace the aging Outlander, and aside from the newish nose, the crossover gets upgrades to the powertrain too. The 3.0 liter V6 gets a 10 HP bump to 230 HP and the automatic transmission gets new programming which allows it to shift into neutral at a stop light, saving fuel at idle. The aluminum roof gets a polished finished for the show car, but don't expect to see anything like it on a production version. 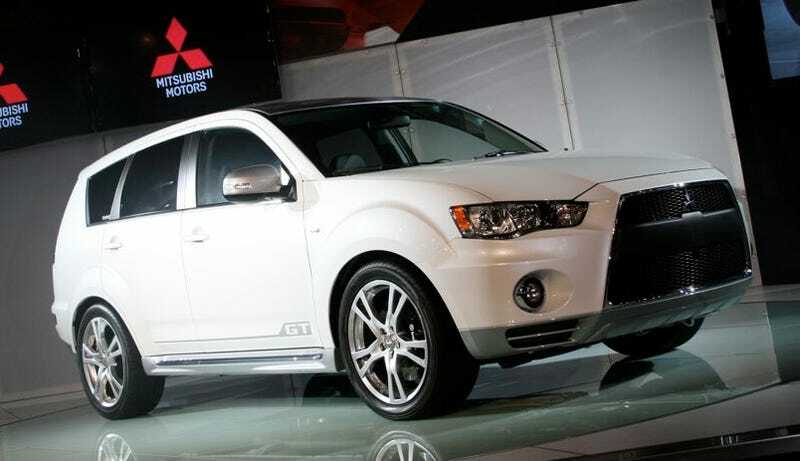 Building on the success of the Mitsubishi Outlander, Mitsubishi Motors North America today conducted the World debut of a distinctive new model that takes the compact SUV to another new level of performance and sportiness - the Mitsubishi Outlander GT Prototype. The all-new design study is the centerpiece of the Mitsubishi Motors exhibit at the New York International Auto Show, which continues through April 19. The Diamond white Outlander GT Prototype infuses performance and design inspiration from Mitsubishi's Lancer sport sedans and provides clear indicators of the future of Outlander. "The Outlander GT Prototype is packed with technology, performance and premium features that are uncommon in the compact SUV class," commented John Koenig, executive vice president of Mitsubishi Motors North America. "Along with its faster heartbeat, we also wanted to quicken pulses by channeling the look of our sportiest cars." A front grille design inspired by the Lancer Evolution's "jet fighter" look is clearly in play on the Outlander GT Prototype, which sports complementary new design elements, such as a reshaped front bumper, side mirrors, fenders and hood. Reshaped Bi-Xenon HID headlamps, a new rear bumper and side sills, plus a bold polished finish on the already standard aluminum roof panel accentuate the sporty appeal. The Outlander GT Prototype also benefits from improvements to the all-aluminum 3.0-liter SOHC MIVEC V6 currently found in the Outlander XLS, including a reduction in intake restriction plus optimized camshaft timing and compression ratio. The engine changes raise maximum output by 10 horsepower, for a total of 230 horsepower, with an improved torque curve for more responsive city driving and enhanced fuel economy and emissions. To further increase fuel economy, the Outlander GT Prototype features an upgraded shifting program and Idle Neutral Logic, which automatically, and smoothly, shifts into neutral during vehicle standstill. It reengages at the slightest lift of the foot off the brake pedal, thereby providing instantaneous response.